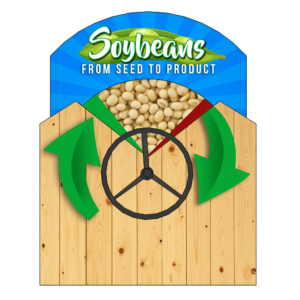 Sometimes even the smallest tools can make a big difference in building connections between consumers and the agricultural industry. You’ve heard of farm to table? Well, this particular display brings a whole new meaning to that phrase. The phrase “farm to table” is generally used when explaining the process of bringing a food product from agricultural production to the mouth of the eater. In the case of this tabletop dairy cow display that recently appeared in our online catalog, though, this phrase means something else. With this display, the farm comes to the table in the form of fun facts about the dairy industry. This compact display may not fill stomachs, but it engages heads and hands with simple interactive elements. On one side of the display, folks quiz themselves with the questions on the panels. They can check the answers underneath by lifting the doors. On the other side of the cutout, people can spin the wheel to learn some fast facts about dairy cows and dairy farmers. 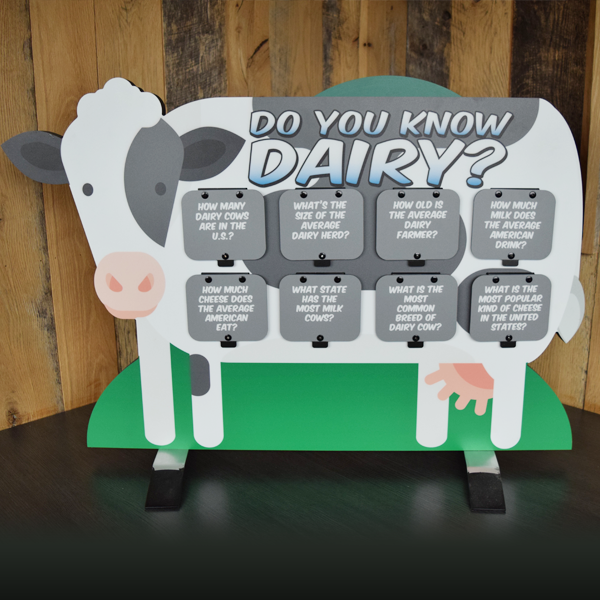 We originally designed this display for the Juneau County Dairy Promotion Council. Although the Exhibit Farm content writing team complied its own list of fast facts for the display, the Juneau County group chose to submit their own content to insert into the graphics. That way, they could highlight the facts and figures that would most likely resonate with consumers in their community. Imagine your average dairy cow: 1,600 pounds, 60 or so inches tall, maybe 100 inches long. Now imagine that standing on a fold-up table at your county fair. Disastrous for the table, right? Well, don’t let that trouble you, because this tabletop cow display is nowhere near the size of the real thing. 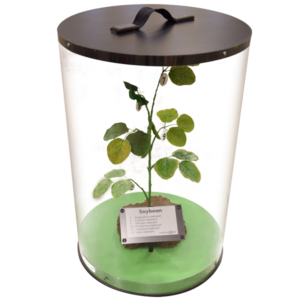 In fact, we engineered the materials in this display specifically to decrease its weight and increase its portability. Not only is it only 35 inches long and 25 inches tall, but it’s also flat. That alone makes a big difference. But that’s not all. You can’t tell from looking at it, but the insides of the cow have been honeycombed out to decrease the amount of material used without risking the stability of the boards. The small supporting feet at the bottom allow this 2D cow to stand up on the table. They can also be removed for flat storage and more convenient travel. So what are you waiting for? 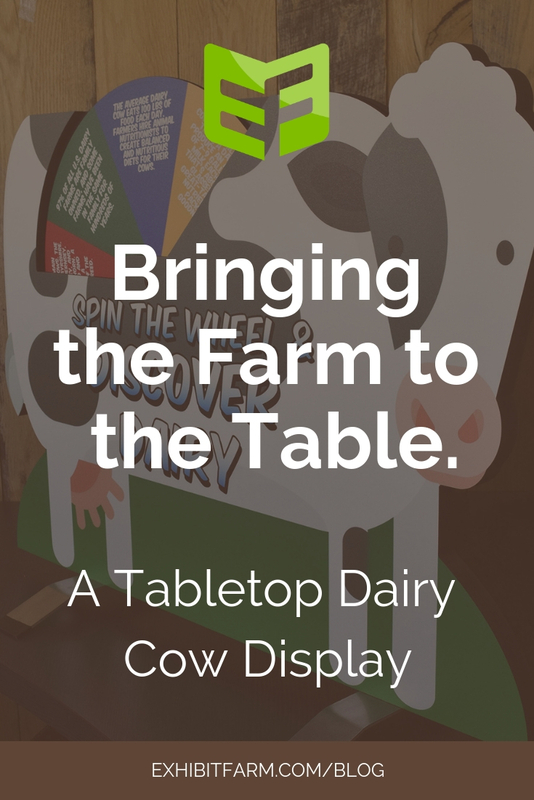 Bring a cute little 2D cow to your own table and spread the word about agriculture.